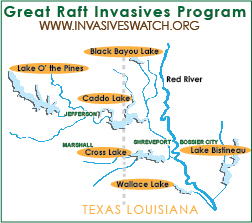 The public can see the work of the project on a website – www.invasiveswatch.org – developed by the National Wetlands Research Center in Lafayette, Louisiana. The website has a unique mapping feature for tracking chemical and biological treatments on the lakes. The site also allows “Weed Wardens” to post their observations at the site.